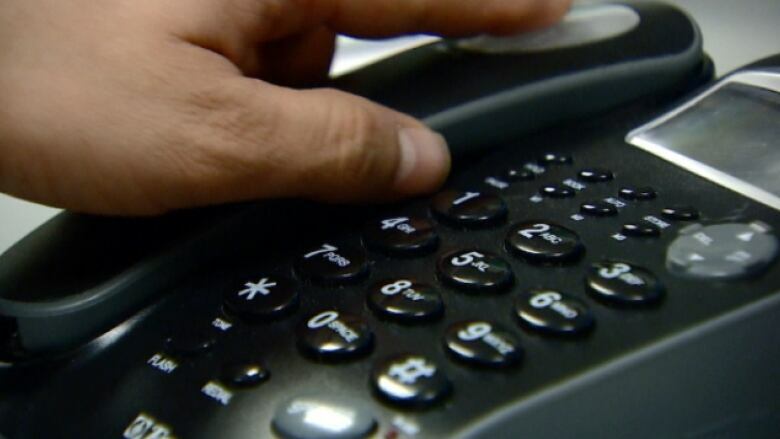 The intimidation tactics used in a phone scam threatening people across Canada that they're in trouble with the tax man were recorded this week by a Thunder Bay woman. The intimidation tactics used in a phone scam threatening people that they're in trouble with the tax man were recorded this week by a Thunder Bay woman. Kim Mazerolle received three calls on Thursday morning from someone posing as a Canada Revenue agent. On the first call Mazerolle said she was told she owed the Canada Revenue Agency (CRA) money and all her assets were about to be frozen. After that call she phoned CRA and was assured she was not in their debt. When the second call came, Mazerolle recorded it and shared it with CBC News. "I just spoke to the local law enforcement and they're already on their way," said someone who identified himself as Agent Jonathan Myers, and gave Mazerolle a "federal identification number" and "case number", saying it would be reflected in police documents. "We have discovered strong evidence and proof that it was not a mistake or miscalculation, but it was your bad intentions to defraud the federal agency, to defraud the federal agency by hiding your tax income," the man said. At this point in the call Mazerolle objected that she never intended to defraud anyone. The man tells her there was a random audit that uncovered an "alarming situation" based on her spending patterns that points to Mazerolle having taken money "under the table'" or "money laundering." He cites four charges that she is allegedly facing. "On this basis CRA is aiming to sue you for minimum $50,000 to $72,000 and if you fail to submit this amount...we are going to take everything away from you by putting a lien on your house, by taking your job away, by making it jeopardized to go ahead with your wage garnishment, putting a lien on your official creditors and public creditors and letting them know about the situation you are involved in and we are also going to contact the local law enforcement," the man said. Mazerolle asked what she can do. The man said there is nothing she can do, that this is her legal notification and the issue is about to be "declared public." "So the police are coming here?" Mazerolle asked. "Yes ma'am," the man said. "We're aware of the location you are. Do not leave it. The detective agencies have already been contacted. You are not allowed to leave that place for the next 35 or 40 minutes because the court is doubting that you are going to run away and escape." On the third call, Mazerolle was asked for her bank account numbers and threatened with jail time if she didn't give them to the man over the phone. "It's scary," Mazerolle said. "I already had it in my mind that this was a scam, but people are going to fall for this and people are going to be bilked out of thousands of dollars." Versions of this type of phone fraud have circulated before, but CRA is becoming more alarmed. This month it noted on its website an increase in these types of calls and the use of unpleasant tactics such as "aggressive and forceful language to scare [taxpayers] into paying fictitious debt." Police services in Ontario, Calgary and British Columbia are now working together in an attempt to catch the people behind the fraud. Meanwhile, the CRA is reminding people that it would never ask anyone to wire cash or use prepaid cards as payments.